We charter fishing trips, on the North Branch of the Susquehanna River, from Ice out usually about March 15th to Ice In,usually about Dec.15th, 7 days a week, weather and water permitting. If you're interested in fishing where most of the public can't get to and you're a little on the adventurous side, join me on my 21ft SeaArk Bayrunner jet boat with a 250HP Mercury Pro Optimax motor. I can take up to 3 people at a time and it's for the entire day, usually between 6 to 10 hours,your choice. You'll want your camera because in the approximate 10 miles that we'll cover, you'll see an abundance of scenery and wildlife.Getting in and out of the boat there is a good chance of getting your feet wet so bring old sneakers or sandals in hot weather and hip or knee boots in cold weather.I also have 3hr and 4hr evening trips for those who don't have the time or would prefer a shorter trip. You must have a valid fishing license if you are legally required to do so to fish from my boat! The cost is small compared to the fine you would receive when caught by either the Fish Commission or the Game Commission officers! You must also by law display your license while fishing! If the officer cannot easily see your license they will approach us and delay our fishing until they are satisfied that we are ALL in compliance with the law! I may ask you if you have a valid fishing license when you arrive. If you don't you will not be allowed to fish from my boat. If you say you have one and just forgot it, I have to contact my local WCO to verify it's existence and then it would be up to him if you can go fishing or not. The Fish Commission could also fine me or worse take my guide license! So please forgive me for protecting my business. You can buy a fishing license from many places including off the internet any day of the week! I do not sell them! I suggest that you purchase your license before you come here because places that may sell a fishing license are far and few between in this area. If your serious about going fishing with me, please book early to get the date you want. It's first come first served on booking. Some of my regular clients book TWO years in advance! So send your $85.00 deposit in. We take check, cash,or you can prepay with Paypal, Credit card must go through my paypal shopping cart on my website.You have 7 days from the time you tell me what day you want until the time the deposit is due.After that time I give your date to the next person who wants it. I live off those deposits in the off season. 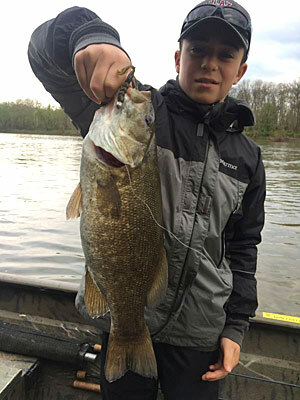 Smallmouth bass in the 15" to 21" range are trophy fish, and mostly female breeders, they take 9 years and more to achieve this size. I don't kill bass.I would prefer that you take measurements and get a fiberglass replica of the trophy fish you catch.They look great and last forever. We want to do our part in ensuring that you may have a good chance of taking a trophy bass in years to come by practicing selective harvest. You may keep any legal walleye between 15 1/4" and 20", rock bass, or channel cats you get. However I usually run 2 charters a day and I don't have the time to filet them so you're on your own if you want to keep fish, I really don't want to contribute to any possibility of you getting sick down the road. I do not have a live well on my boat, since I don't keep fish I don't need one. if you keep a fish be prepared to put it in your lunch box . The fish Commission recomends no more than 1 fish meal a month be eaten from the river. 8:00PM to 9:00pm, to finalize everything at (570)-250-1147. We fish rain or shine, however I reserve the right to cancel any charter due to weather conditions or flood stage water where passenger safety is at risk. The charter may either be rescheduled or the deposit refunded. If you cancel for ANY REASON, at any time, the deposit is non-refundable! If you cancel after I meet you at the river, you owe me for the entire day! Things sometimes can and do happen on the river while fishing that we can't control. If I need to stop a charter short for ANY reason you will only owe me for the hours we were on the water. If you stop the charter short for ANY reason you will still own me the entire amount of money for the entire scheduled charter. You have 7 days from the time you booked to the time your deposit is due to confirm your charter , after that I must give the date to the next person who wants it. © 2009 L.D. Guide Service. All rights reserved.